Monitor an array of conditions with a single device, the FIBARO Z-Wave Motion Sensor (Gen5, U.S.), an upgraded model over the original. Now with Z-Wave Plus certification, this Gen5 Motion Sensor is compatible with all major Z-Wave hubs and controllers. Like the previous version, the sensor is one of the smartest Z-Wave sensors you'll find. The four-in-one wireless multi-sensor serves as a PIR motion detector, light level sensor, temperature sensor, and vibration sensor (accelerometer). 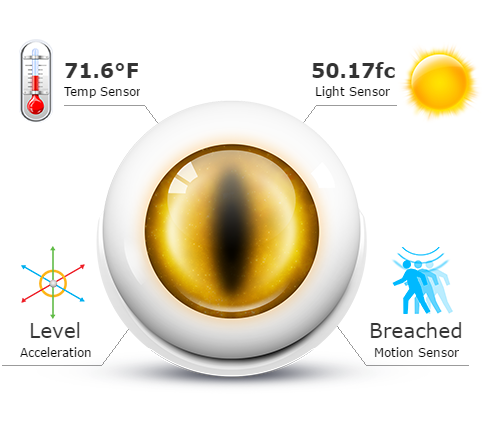 Unlike any other motion sensor on the market, the FIBARO Z-Wave Motion Sensor features a unique, multicolor LED "eye" that changes when different environmental conditions are detected. When motion is not present, the LED eye's color indicates the current temperature. By default, red/orange reflects heat, blue reflects coldness, and green reflects the normal range. You can choose which colors show for different conditions by customizing the sensor's settings. 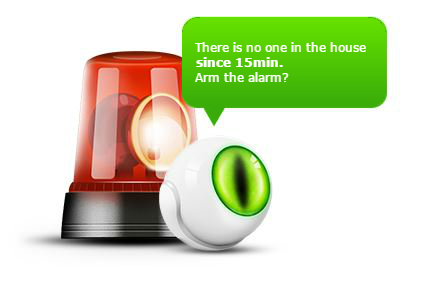 If you install one FIBARO Motion Sensor on each side of your door, the sensors can tell you detailed information about a room's occupancy. You can see at a glance whether or not someone is in the room, and how many people have entered and exited. It's perfect for making sure your children are safe and sound when left home alone. You'll be able to know what time(s) he or she exited and returned, as well as the number of guests that were with him/her. About the size of a golf ball, the small, spherical motion sensor sits on a tabletop, or mounts to a wall or other flat surface with the included screw. Simply screw the small plastic bracket to the wall and then pop in the sensor. You can adjust the sensor up/down to achieve the perfect angle. NOTE: Requires a Z-Wave network controller. With multiple award-winning products, FIBARO has become one of the leading Z-Wave manufacturers in the home automation and security industries. The company has been lauded time and time again for bringing uniquely innovative Z-Wave solutions to people across the globe. Introduce your home to your imagination through FIBARO. Radio Frequency: 908.4 MHz U.S.